Archive by category "Captain EO"
L’attraction Captain EO a fermé ses portes à Disneyland Paris… Mais il ne s’agit que d’une fermeture saisonnière. Four studio albums. Countless sessions. Video mixes. Dance mixes. Three world tours. A ranch called « Neverland. » This was Brad Sundberg’s life and career for nearly 18 years, working closely with the King of Pop himself, Michael Jackson. This is your chance to hear of the music, the stories behind the music, and what it was like to be a part of Michael’s team. This is a one-of-a-kind music, photo and video-filled seminar. Brad had the opportunity to work closely in the studio and at Neverland Valley Ranch with Michael Jackson. He was Michael’s technical director and one of the engineers on four studio albums including « Bad », « Dangerous », « HIStory », and « Blood On The Dancefloor. » (Michael even gave Brad the nickname « Really, Really Brad ».) These mammoth projects (including production, tour-prep and countless remixes) took upwards of 16 months each. You will see and hear what it was like to be in the studio with Michael and the team of engineers and producers who created these songs, through a carefully crafted timeline of music, video and behind-the-scenes info. 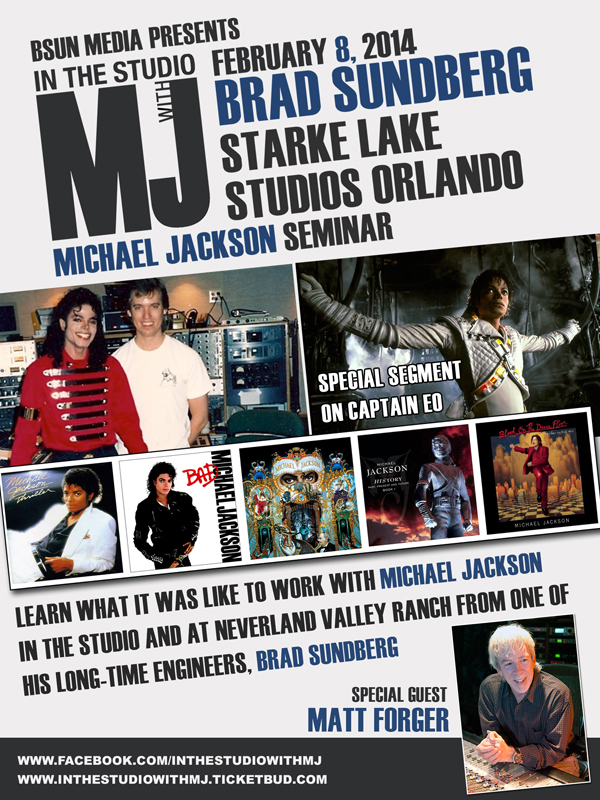 From « Captain Eo » to « Man In The Mirror » to « Smile », Brad was there, and you will hear about the production process. Special Guest Matt Forger will be joining Brad for this amazing event. Matt brings a wealth of knowledge as he was there for Thriller and he completely recorded and mixed Captain EO! Brad and Matt have been friends for many years, and Matt has agreed share his stories and insights, particularly on the Captain EO project. Brad and Matt, together in a seminar for the first time ever. No script, no second-hand stories – these guys were there, and they are very excited to share their stories, music and home-videos. You do not want to miss this! Details: The event will be offered on February 8, 2014, at 12:00 PM . There are a limited number of tickets available, and the seminar will include a catered dinner with Brad and Matt. This will include one of Michael’s favorite « Family Friday Dinners », and give you extra time to ask questions and hear a bit more about their time working together. In the unlikley event that the seminar is cancelled, ticket price will be refunded. 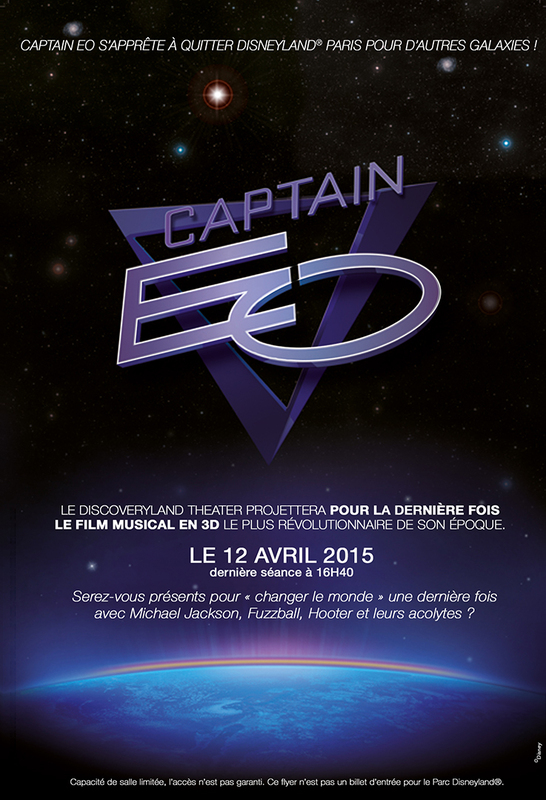 25 mars 2012 – L’attraction 3D Captain EO fermera ses portres de façon temporaire le 02 avril prochain. Elle sera réouvrerte selon les pics d’activité du parc, à l’instar d’autres attractions (Le pays des contes de fées – Fantasyland, Autopia – Discoveryland…. ).